Maybelline x Gigi Hadid Lipstick in Khair Review | LIPS n BERRIES! 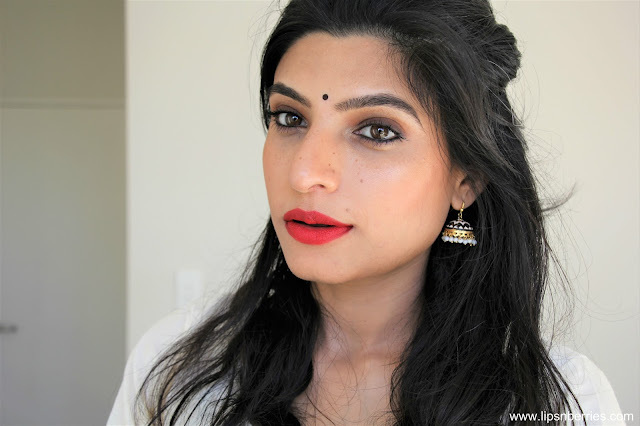 Long time, no lipstick review. 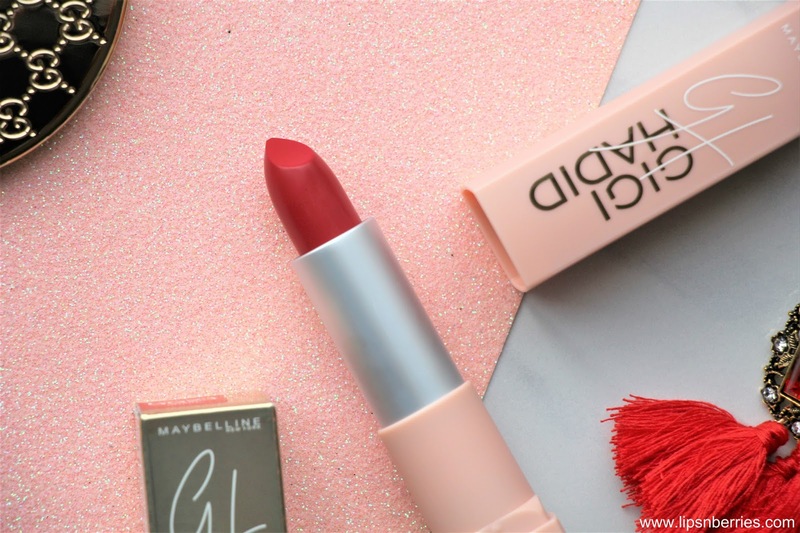 Even though there's heaps of lipstick blog posts waiting for some daylight in my drafts folder, I'm totally going to ignore them and proceed with this fairly new release- Maybelline x Gigi Hadid Collaboration in the shade 'Khair'. There was so much interest in it when I posted about it on my Instagram Stories. I got gifted this one by my dearest Shayoni (from Sweet & Bitter Blog), who definitely went out of her way (literally!) to come see me off at Delhi Airport when I left India in January this year. She chose such beautiful keepsakes for me but it is her smile (which for some reason I can't get out of my head) and her genuine love and kindness that I'll remember for life. Meeting and getting to call such an amazing humans my friends & my tribe is the highlight of my blogging journey. Maybelline launched this collection collab with the supermodel and ever so stunning Gigi Hadid, sometime late last year. The products have been flying off the shelves ever since. I do not own any other product from this collection except this lipstick so I can't comment on their quality & finish. 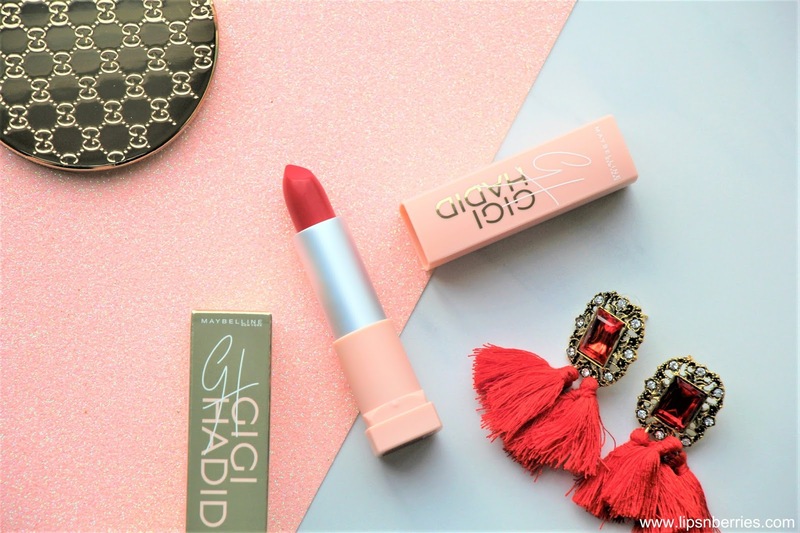 The collection features three categories of products that represent Gigi's roots and lifestyle- East Coast Glam, West Coast Glow and the Jetsetter Travel Makeup Palette. Packaging is what catches my attention first thing when I see this collection at the stores and on various blogs. The pastel peachy/blush hues are both feminine and elegant at the same time, just like Gigi! 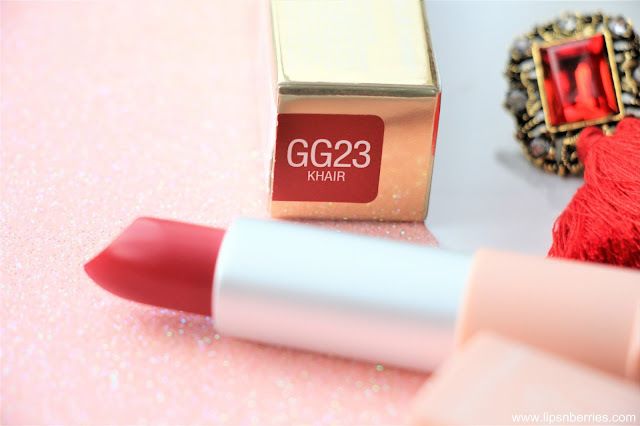 The lipstick shade I'm talking about today is Khair, a beautiful warm red from Gigi's West Coast Glow Collection. The formula is very moisturizing & doesn't drag on lips one bit. It isn't very shiny either (these lipsticks are marketed as mattes), so a perfect balance of pigmentation & comfort. 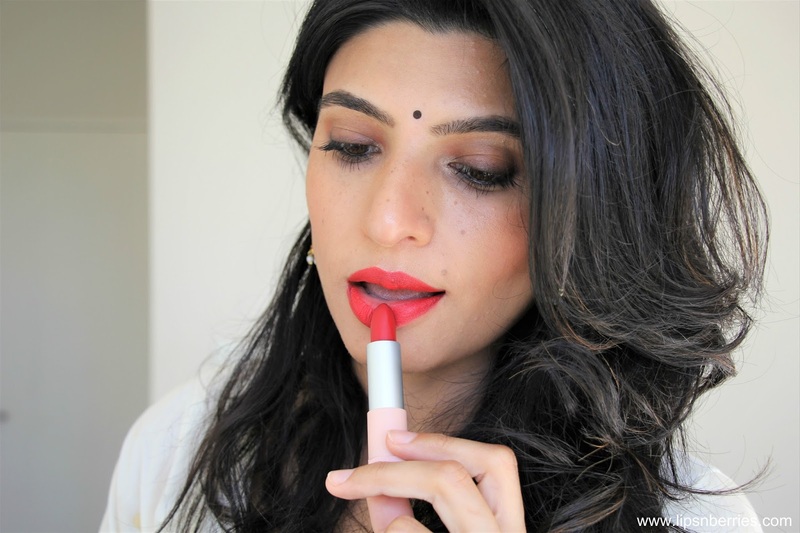 If you have dry lips and tend to stay shy of matte formulas, you'd love this one. It doesn't accentuate any flaws on your lips. Coverage is full on one swipe. 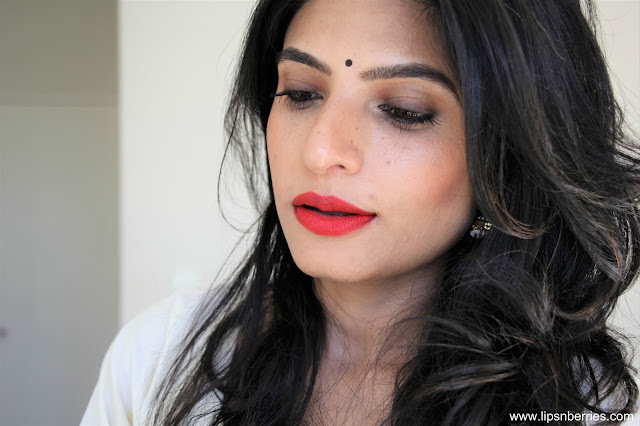 If you are a fan of matte lipsticks like me, you'd have to get used to that slight sheen, its all those emollients in the formula. The shade is warm red, best to call it rusty red on my NC 35-ish skintone. I received many queries asking how it compares to MAC Ruby Woo lipstick (Click here for review) as somehow they both look alike on my face. I'd say that although both these reds are full coverage and highly pigmented, the similarities end right there. 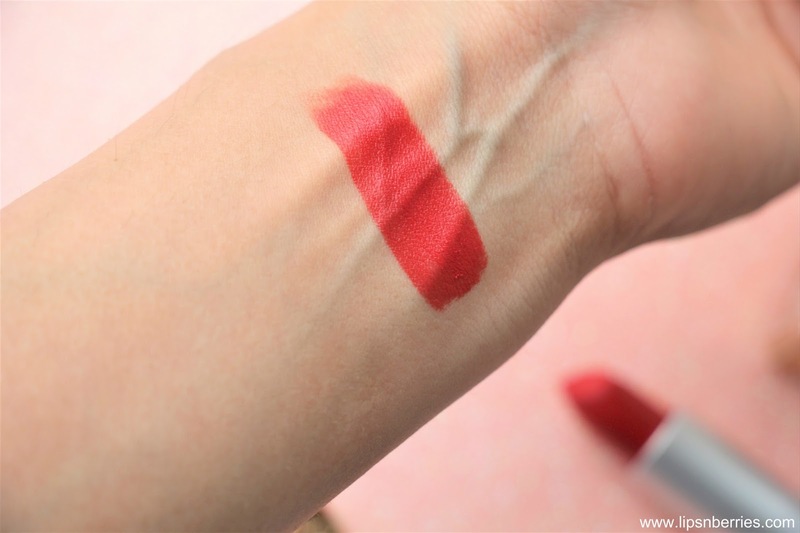 Ruby Woo is a cool red and it is also retro matte, so the matte-est of all mattes, mother of all mattes. Khair is moisturizing and never drags, unlike Ruby Woo. It is also warm and rusty red in color. The wear times differ as well. 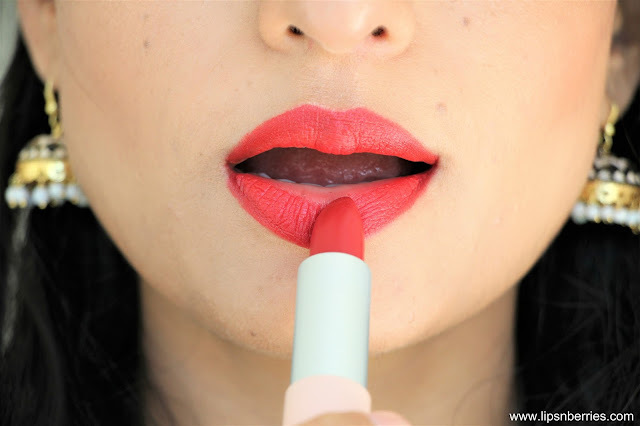 We all know how well Ruby Woo wears, thanks to its super matte finish. Khair, being emollient, doesn't last quite as long (4+ hours). 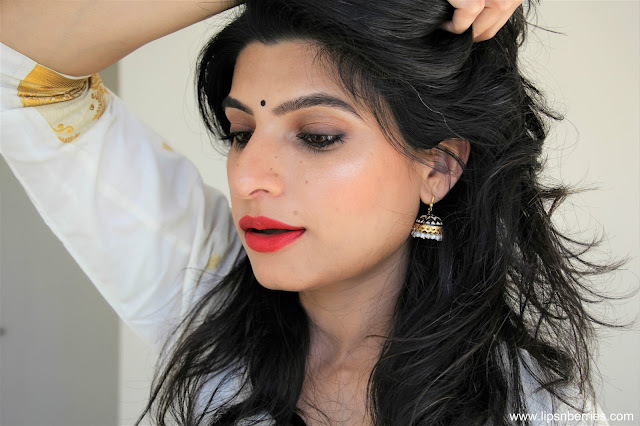 Khair also has the tendency to smudge & transfer, unlike Ruby Woo. I hope this clears the confusion. Bottom line, this lipstick from Maybelline is quite worth its price of $25 NZD (Currently on sale in Farmers NZ stores for $20). It ticks a lot of boxes and will also be flattering on a lot of skin tones, but if you are a fan of matte or retro matte finish, you'd probably not reach for it as much as you'd like to, specially before going out for events that involve burgers. For anyone with dry lips, you'll love it!